The MiR Air Flow vest is design to provide maximizes air flow though out your body while vest is in use. This breathable feature keeps your body cooler during workouts. With a denim like feature, this vest is machine washable and machine dryable. 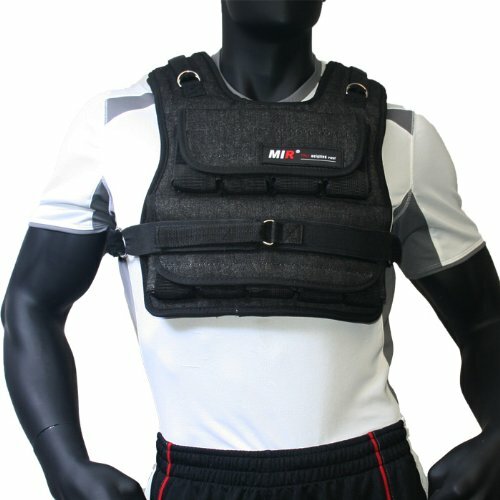 This keeps the AF vest from retaining any odor during workouts and other activities with the vest. This design is intended to make sure your sweat is easily absorbed by the vest instead keeping the sweat between your body and vest. This 2010 feature ensures you do not to spend any extra money on sweat defending accessories, and you can use this extra cash to upgrade to the higher weights that you always wanted. Also MiR sells grade A product and great low prices. This vest does come with a Life Time Warranty Services. Features include adjustable shoulder straps to make sure that you can adjust the length. Also it includes adjustable Velcro belt to adjust the width. With these two features, this ensures that you will get a vest that stay tight to your body, and a vest that can be clean by simply throwing it into the washer. A vest made to keep its brand new scent and feel all year round. All upgradeable individual packets can hold up to 50lbs. 40 Lbs. Total, Increment 3Lbs. One Velcro belt included.